THANKS FOR CHECKING MY ITEM OUT, VISIT MY STORE FRONT PAGE AT -FACEBOOK.COM/VINTAGEANDCURRENT ATTENTION INTERNATIONAL BUYERS - I USE EBAY GLOBAL SHIPPING, SO PLEASE DON'T ASK ME FOR SHIPPING QUOTES, THANKS! 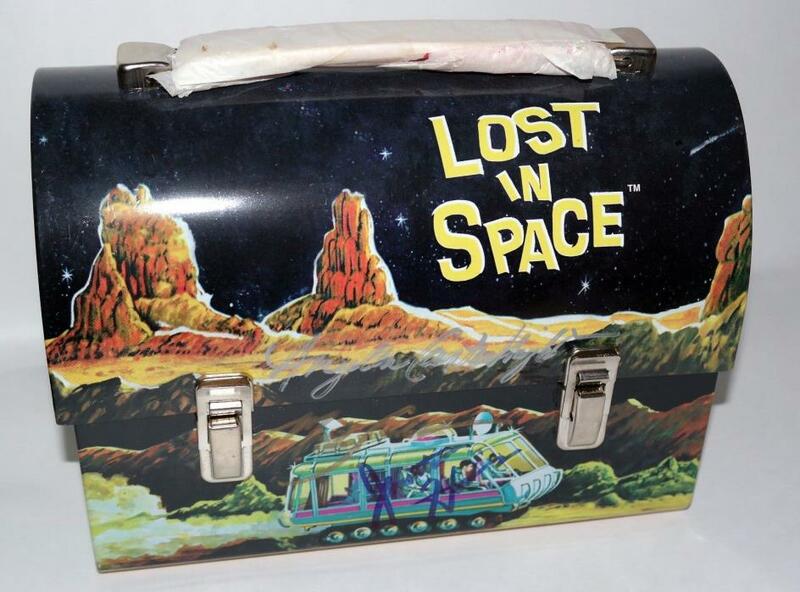 THIS IS FOR A - LOST IN SPACE LUNCHBOX SIGNED BY 7 CAST MEMBERS THIS IS AMAZING!!! BEING THAT THIS REPRODUCTION LUNCHBOX IS RARE NOT COUNTING THE 2 DECEASED MEMBERS, THIS IS THE ONLY ONE KNOWN TO EXIST! THESE WERE ALL HAND SIGNED AT A FEW DIFFERENT CONS OVER THE YEARS, ALL HAND SIGNED, NO COA BUT YOU CAN 100% TELL THESE ARE REAL AND I GUARANTEE IT! AUTOGRAPHS INCLUDE - JUNE LOCKHART - GOLD MARKER (91 YEARS OLD NOW AND NO LONGER SIGNS) BILL MUMY - GOLD MARKERJOHNATHAN HARRIS -BLUE MARKER (DECEASED)BOB MAY - SILVER MARKER (ROBOT DECEASED)ANGELA CARTWRIGHT - SILVER MARKERMARK GODARD - GOLD MARKERMARTA KRISTEN - SILVER MARKER PET AND SMOKE FREE HOME!